It seems inconceivable that no nationally (or even internationally) recognisable historic figures frequented Salisbury’s Red Lion in centuries past. But, if they did, no reliable record of their having stayed remains. However, this famous old inn certainly deserves recognition here on account of its sheer age. Indeed, it proudly suggests that it might be the longest-running purpose built hotel in Britain. 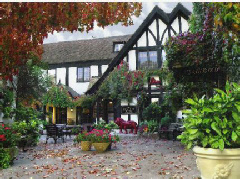 Originally known as The White Bear Inn, the place was built specifically to accommodate some of those working on the construction of Salisbury Cathedral. Later it would become one of the most important coaching inns on the route between London and the West Country. How much, if any, of the original 13th century structure remains is difficult to say (the stone fireplace may well be of such age), but elements of the 1500’s are certainly still in existence.